A controversial Spanish engineer-architect journeys to building sites around the world. A renowned structural engineer attempts to defy gravity. Two architects search for the best—and sometimes most unusual—solutions in urban planning and development. And celebrated Swiss architects design an iconic Olympic Stadium for the Beijing games. Christoph Schaub’s documentaries tell these stories and more in this collection of nine of his films. 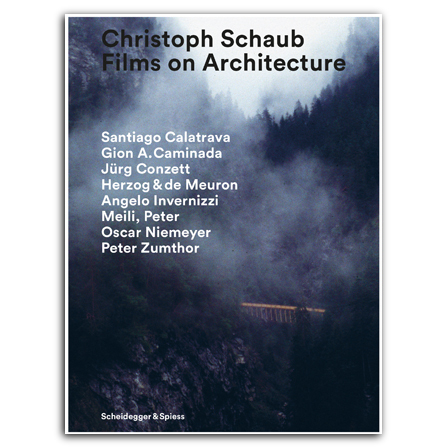 From his first, award-winning documentary Il Girasole—A House Near Verona, about an experimental rotating house in Italy, to Brasilia—A Utopia Modernity, which explores the exhilarating experience of building Brazil’s capital city, Schaub’s documentaries prove that architecture can actually be captured on film. Through his moving images, as well as his way of looking at and showing architecture, he captivates viewers instantly as he tells fascinating stories about internationally renowned architects—including Santiago Calatrava, Herzog & de Meuron, Oscar Niemeyer, and Peter Zumthor—and the buildings they create. The three DVDs offer each film in its original version with subtitles in English, French, and German, and the accompanying booklet presents a short essay on Schaub’s work and brief introductions to the ten films. , born 1946, is a pucblicist and critic. He has been working for many years as culture editor for Swiss Broadcasting Corporation's German-language radio programs and the leading Swiss weekly newspaper NZZ am Sonntag.